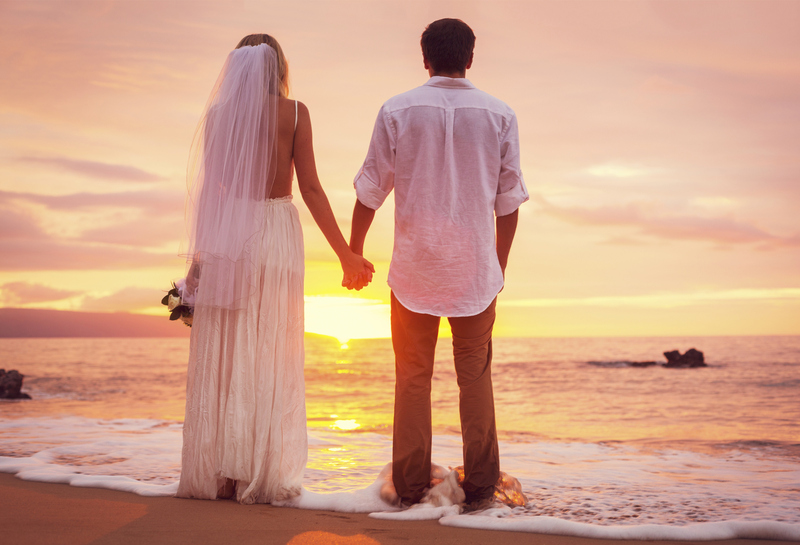 If you love the great outdoors a relaxed beach wedding can be very appealing. Whether you choose your local coastline, or a tropical destination wedding venue, a sun drenched beach provides the perfect location for your ceremony. A beach also provides a great backdrop for wedding photos, and the opportunity for some truly unique shots. 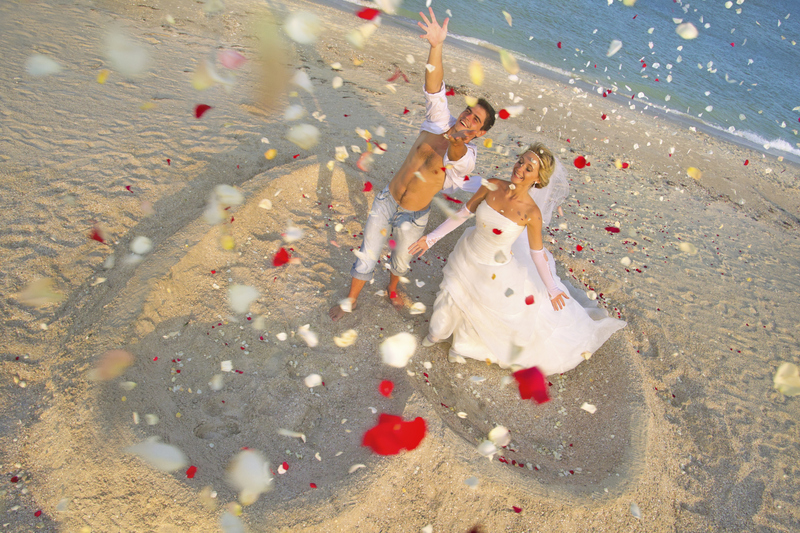 These tips on beach wedding photography will help you achieve stunning pictures. A beach venue can look totally different at various times of the day due to the change in light. If you have a daytime ceremony try to return to the beach for a few photos in the evening. The light will be warm and golden at this time and will give a more romantic effect than the full midday sun. If you are having photos taken looking out to sea, make sure the horizon line is parallel to the edge of the photo, and that it is slightly off centre. Having the horizon in the middle of your picture will give the impression that the photo is cut in half. A beach wedding provides plenty of opportunities for feature photos. Have one of the groomsmen with their trousers rolled up ankle deep in the sea, or the bride and groom’s wedding shoes at the waters edge. Draw a heart in the sand and place the wedding rings inside it for another great photo. The sea is a stunning backdrop to your wedding vows, but unless there are crashing waves and jagged rocks it can be a slightly dull background to your wedding photos. Try to find a photo location where you can see both the sea and some objects on the coastline such as palm trees or colourful fishing boats. Assuming you have chosen a sunny day for your wedding, the light on the beach will be very bright for the average camera. Using UV and polarising filters can help to block out some parts of the light and can reduce atmospheric haze and reflections and highlight contrast. Photographic equipment is more likely to get damaged at the beach than at almost any other location. Sand and salt water aren’t especially kind to expensive cameras so make sure your photographer has adequate insurance for shooting on the beach. Just because you’re getting married on a brightly coloured beach, it doesn’t mean your photos have to be brightly coloured too. Black and white and sepia beach wedding photos can look fantastic, and if your wedding day happens to be overcast these will look especially good.